I was going to call this post SNOW JOB because that’s what we got from the mayor and the governor last week. I lost a days pay because I couldn’t get downtown because the subways were closed. I remember once riding the L train to Bushwick during a big snowstorm in ’96 and seeing actual snow drifts on the tracks between stations, and the train went really slow, but it didn’t get stuck. It snowed so much the snow was drifting in from the ventilation grates. Then there was the storm in 2010 where I wasn’t sure there would be an M train, at the time I lived in Williamsburg and the J and M trains passed right by my window and I knew to the second when the next train was due, but the morning of the storm there was only eerie silence. I went up to the Flushing avenue station anyway and was rewarded with the sound of an M train pulling into the station. Of course it took an hour for it to get to Essex Street in Manhattan, a trip of normally 9 minutes, but the train got there. Some people out in Broad Channel weren’t so lucky, they had to get off the train and walk. I understand how the mayor doesn’t want to lose his job because he wasn’t prepared for the snow, but there is such a thing as being over-prepared. This country has the obsession to try and control everything, therefore we have all these laws and regulations and agencies and bureaucracies and red tape that it’s a wonder we ever get anything done. And New York City (and State) is about the worst offender in the country, that’s why it’s so hard to run a business here and we keep losing them. In the end, though, no matter how much you prepare for any eventuality, the unexpected always happens, and we find ourselves with egg on our collective faces again. So why bother? Fear, that’s why. We live in a scared society. So we need laws and lawyers to give ourselves the illusion that we’re going to be safe and comfy. But the world is full of unsafe and uncomfortable situations, and we can’t control them all. Now that I’ve gotten that out of the way, I can talk about how beautiful snow is, I love snow, wish it were around all of the time. I’m not such a big fan of ice and slush, though. Last week’s storm was snow, just enough of it to make the city quiet and pretty for a few hours at least, and yesterday’s storm was that hybrid animal that you don’t know if it will bite you or run. When I awoke yesterday I knew it was snowing because of how bright it was in the apartment, and how quiet it was. The kind of quiet you normally get in the country. I didn’t even hear traffic out on Amsterdam Avenue, just over the roof of the garage next to our building. Just dead silence. Snow is nature’s great sound absorber; the best sound insulation ever created. I wish I could fill the space in my walls with snow so I wouldn’t have to hear my neighbor’s loud parties, music, or TV sets. Or their scrapping chairs, footsteps, arguments, or banal conversations. Let me think about that one. When I went out yesterday I was prepared to walk slow on the icy streets. 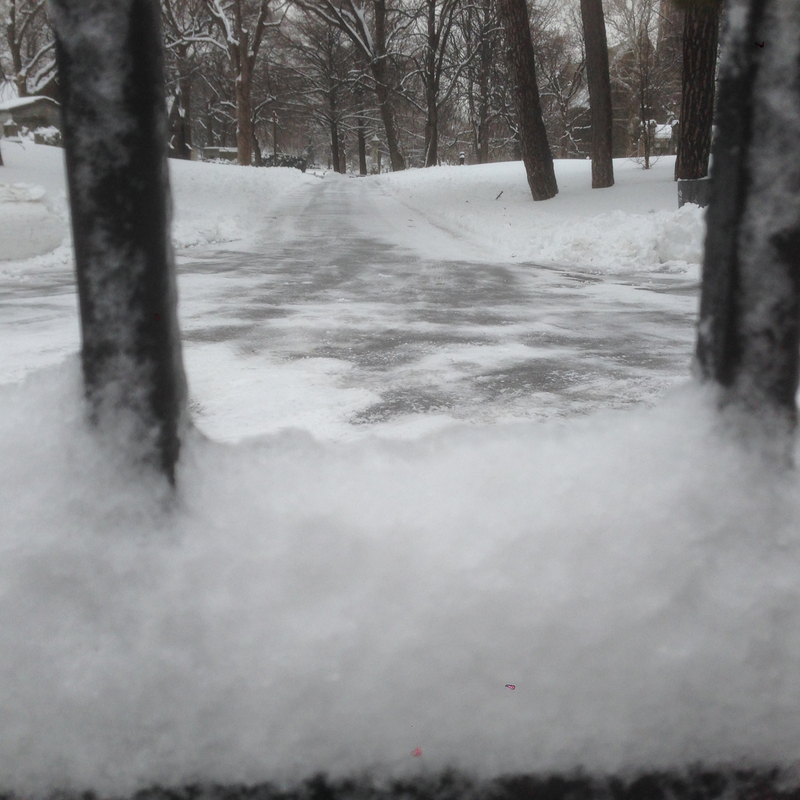 It’s funny; the city prepares for everything but does nothing to keep the sidewalks clear and passable. That’s left to the building owners, and a lot of them find it too expensive to make sure the sidewalks in front of their property is cleared. And then there are the stretches of sidewalk the city owns, like the block between 152nd Street and 151st on St. Nicholas Avenue. There is a community garden there called Convent Gardens, on account of Convent Avenue forms one side of the triangle that the garden is in. I wonder if it’s a play on the London Convent Gardens, or the name is just a fluke. But that stretch of sidewalk was left uncleared for most of last week. There was no way I was going to try and negotiate that yesterday, so to get downtown I went to the 155th Street station to the north. That entailed walking down the hill at 154th Street, and man, it was treacherous. The snow had turned into a frozen rain by that point, and even though the super of the building on that corner had shoveled the snow, the sidewalk was now covered with a thin sheet of wet ice. The guy had not salted it yet. So I made my way down the hill as slowly and gingerly as I could. I’m too old to take a fall these days. Danusia slipped and fell the other day, she likes to walk fast and had on boots that don’t have a lot of traction. She skinned both knees. When I came back it was snowing again, and a lot of the streets had been cleared, but now all of the crosswalks were a morass of water and slush. Luckily I bought a pair of Uggs waterproof shoes some years back (On sale at DSW) and was able to navigate these huge puddles without getting my feet wet. But there was still ice in patches, and I had to pick the best streets to walk on. 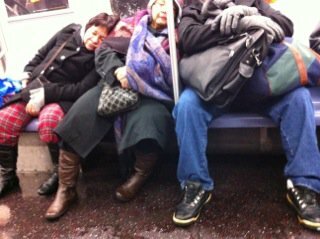 The Uggs are great for keeping your feet dry, not so hot on traction. 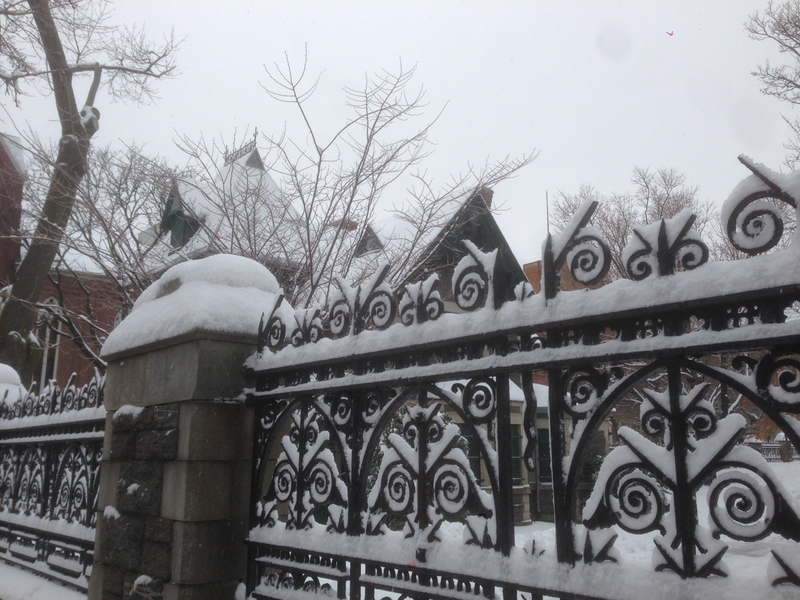 The best place to walk is by the Trinity Church cemetery on Amsterdam Avenue, they are always good about clearing their sidewalks. 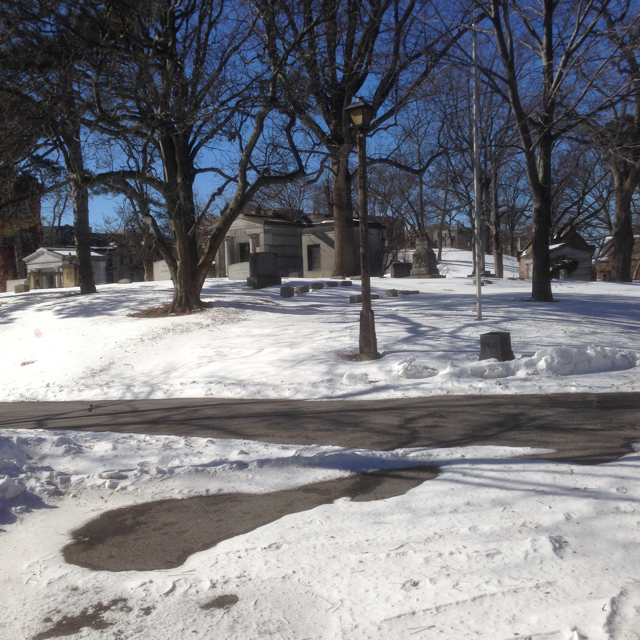 And besides, the cemetery looks beautiful covered in snow. When I came home from my writing class last night the streets were in the last phase of what can happen to water in the winter. The temperature had dropped dramatically and everything was (mostly) frozen solid. I took a 1 train to 145th Street and Broadway where I hoped to catch an uptown bus. As I waited for the bus I marveled at how empty Broadway was at 9PM on a weekday evening. There was hardly any traffic, and the mayor hadn’t ordered it done. 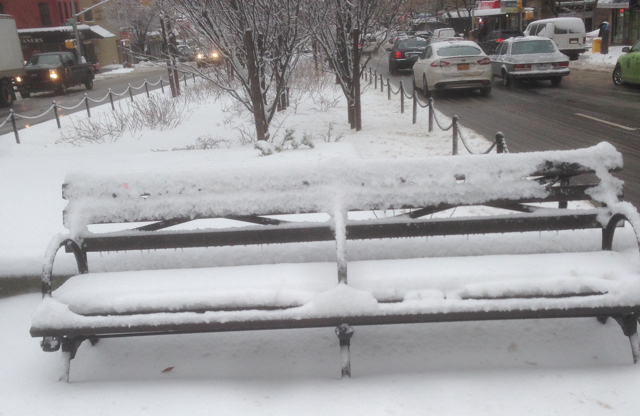 And it was still pretty quiet, despite the herculean effort to remove the snow and ice by the Department of Sanitation. That’s the best thing about heavy snow in the city, the peace and quiet it pulls over the city like a warm quilt. Sometimes you just have to take what you get. This entry was posted in Uncategorized and tagged acceptance, blizzards, contingency plans, control, humor, ice, insulation, make me laugh, obsession, quiet, slush, snow, Uggs. Bookmark the permalink. Here in Wisconsin nothing shuts down for snow. One of the only good things about living somewhere where it’s so darn cold.